The pickup: Several slices of fresh salmon, troll-caught off the Oregon coast. The results: Back in my college days, I played waitress one evening at a professor-hosted dinner party. On the appetizer table was a slab of homemade cured salmon, beautiful to the eye and richly unctuous in the mouth. Over the years since then, I've tried to replicate it. 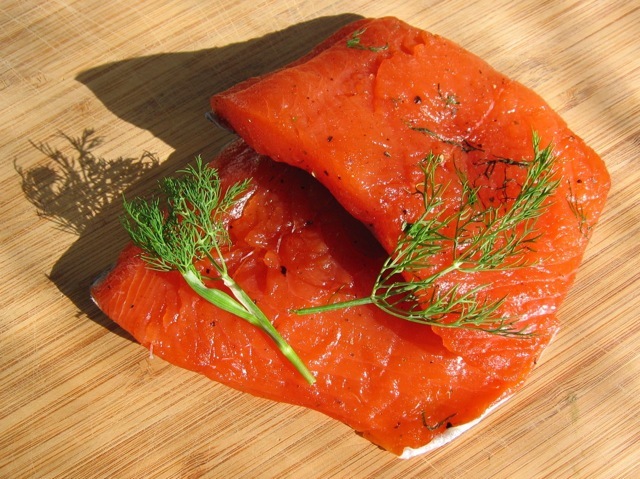 Seattle chef Tom Douglas offers a cured-salmon recipe featuring juniper berries in his book Tom Douglas' Seattle Kitchen, but the gin flavor of the berries is a little, well, potent. Last week I tried a recipe by San Francisco chef Traci Des Jardins (originally published in the September/October 2005 issue of Chow magazine, now available online at the Chow webzine.) This was more like it: smooth, creamy, and tangy, with salmon (not gin) as the dominant flavor. However satisfying, the Chow recipe was a little vague in its measurements, calling for vast quantities of salt and sugar and a widely varying amount of fish. So I adjusted all the measurements (the full recipe is available in the Culinate Kitchen), left the fish in the fridge overnight, and dined on it the next day. It was perfectly tasty served with crackers and a bit of crème fraîche, but quite delicious all by itself, too.